Due to the square wave output of the Portsdown ADF4351 Local Oscillator module, filtering is required between the output of the ADF4351 module and the modulator board LO input when used on 146 and 437 MHz. This filter only needs to be a simple low pass filter to remove the third harmonic and no filtering is required on 23cms. The effect of running without a high pass filter on 146 and 437 is an imbalance in the modulator resulting in reduced MER and RF performance as seen on the screen shots below - it does not affect the transmitted spectrum and is OK to put on air. To simplify this problem the team have designed a small PCB which will switch in the correct filter for all 4 bands automatically based on commands from the RPi. Note that R05 and R06 were not fitted before this photo was taken, They are both required to be fitted for optimum performance. The filter makes a significant difference to the transmitter performance and we recommend everyone should include one in the system. Spectrum plots of the filters and tables showing the detailed performance and output power of the Portsdown modulator board with and without filtering on the LO input are available here. We do realise that the PCB contains some small surface mount parts but take a look at Colin's excellent video and give it a go or build one of the simple single band filters detailed below. The revised parts list is available here - minor errors corrected on 7th March and 3 April 2017. Note that R08 is not used. Parts list is available as bare bones parts list, or Bill of Materials, in an .xls file which you can upload to Digikey. Change the "First part Record begins on Row" to "2"
Use the column drop down boxes to match the first 3 column titles to the .xls file. Note the final 2 columns are for your reference only - on some tape and reel components you are ordering more parts than required as this is the most economical price break - you can change these in the .xls if you require but Digikey will then mark them as a query item. Then simply checkout and pay Digikey and it will automatically order all the parts you require to construct the board which will arrive bagged up marked with circuit references. This is the recommended way to order your parts if you decide to build the board yourself, but you can of course order the parts from your own supplier. For those who just want to operate on one band, the project team have designed 3 simple single band filters which can be hand built very easily. The left hand filter is for 146 MHz. It is series L, shunt C, series L in a T configuration. The inductors are each 4 turns of 24 swg tinned copper wire wound on a 4.5mm drill. The capacitor is 27 pf ceramic. 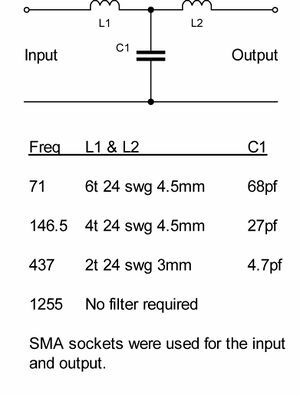 The filter has 1.5 dB insertion loss at 146 MHz and >25 dB loss at 440 MHz. A "Black" eBay ADF4351 board typically gives -0.5 dBm when set to output level 3 at 146 MHz, so the input level to the modulator is -2 dBm, which is the recommended level. The right hand filter is for 437 MHz. Same configuration, the inductors are 2 turns of 24 swg wound on a 3mm drill, and the capacitor is a 4.7 pf ceramic. The insertion loss at 437 MHz is 2 dB and the attenuation at 1300 MHz over 17 dB. The resulting input level to the modulator is about -2.5 dBm. Note that the inductors are at right angles to reduce cross-coupling. Both filters raised the output MER to 26 dB (measured in MiniTioune 5a). Right-angled SMA chassis sockets were fitted to one end of each, so that they could connect directly to the modulator without another cable. No filter is required for 1255 MHz. The third filter for 71 MHz is not shown, but was constructed in a similar manner. The inductors were each 6 turns of 24 swg tinned copper wire wound on a 4.5mm drill, and the shunt capacitor was 68 pf. The MER improvement was not so marked, because the modulator phase shift network is out of spec at this frequency. However, the signal is fit for transmission. 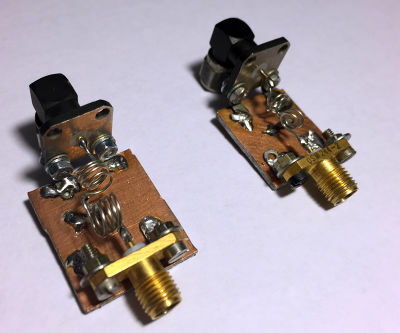 NOTE: These are simple low pass filters and not suitable to be used on the output of the modulator filter board - see this wiki page for filters designed for transmitter and receiver filtering. This page was last modified on 14 November 2017, at 12:00.